Nature's most energising herb. Derived from the same sources used for centuries by the Amazon Indians. If you suffer from "mid-afternoon blues" this product will get you through to the end of the workday and beyond. It is also ideal when additional demands are placed on you and you need to "go that extra mile". Each tablet contains 4% naturally associated caffeine. Increases mental alertness. Ideal for study, exams or mentally challenging work. A climbing shrub native to South America, guarana has been used for centuries by the Amazon Indians for it's energising qualities. Today in Brazil, it is added to soft drinks for the natural, energetic feeling it provides. Guarana is gentler on the digestive system than many other forms of caffeine, and preferred by many as an alternative to coffee. 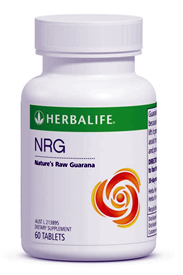 NRG tablets provide you with the benefits of one of nature's most energising herbs. Herbalife has captured the high-powered qualities of Guarana in NRG, to enhance performance and give you an invigorating lift during the day. An excellent addition to a busy lifestyle that will help keep you 'on top'. Do you suffer from fatigue and physical tiredness? Reducing calorie intake can play havoc with your energy levels resulting in periods of physical tiredness. 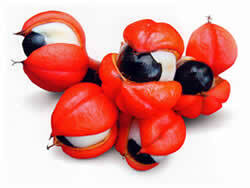 Guarana can help provide an invigorating lift, it is easily absorbed and gets to work quickly. Why is Guarana a good replacement for coffee? What good will Guarana do? Like drinking coffee, the herbal compounds are quickly absorbed into the system so that within about half an hour you will feel the difference. When should I take Guarana? You can take up to four Guarana tablets during the day (but avoid taking them during the evening unless you particularly want to stay up late). Take them with water instead of drinking coffee mid-morning and mid-afternoon, for maximum benefit. Do you suffer from a mid-afternoon 'slump'? If you are one of those people who suffers from clouded concentration mid-afternoon (half way between your lunch and evening meal), try taking Guarana tablets and feel the benefit of the plant's naturally invigorating effect. *Vitamins can only be of assistance if the dietary vitamin intake is inadequate.